Last January I wrote about people who set some impressive goals for 2015. These were people who planned to run every day or planned to bike over 75,000 miles during the year. I wanted to check back to see if they actually achieved their goals. First there was Robert Kraft, a 65-year-old songwriter from Miami. Robert planned to run every day in 2015. More correctly, he planned to keep running every day in 2015. You see, Robert is a member of the US Running Streak Association and he has been running every day since January 1, 1975. I went out to the US Running Streak Association web site and checked. Robert made it through another year. In case you are wondering, Jon Sutherland, a 65-year-old writer from California holds the top spot on the Running Streak leaderboard. Jon has run every day since May 26,1969 – over 46 1/2 years! Steve Abraham is an Englishman who had a goal of biking every day at least 200 miles. In doing so, he hoped to bike a total of 80,000 miles in 2015 and break the record set in 1939 by Tommy Goodwin, another Englishman who biked every day for a year for a total of 75,065 miles. Unfortunately, Steve had a collision with a drunk on a moped back in March and ended up with a broken ankle. Although he tried to keep going on a recumbent trike, Steve had to stop biking and spend some time healing. Steve got back on his bike on August 8 and he ended up biking 63,568.2 miles for the year. But Steve still wants to set a 365-day cycling record so he also started a new attempt at the record. (The Ultra Marathon Cycling Association rules allow him to also use the August 8 date as his start date for this new attempt.) Sadly for Steve, on January 9, 2016 Kurt Seavogel finished his own 365-day cycling marathon and set a new record of 75,496.5 miles. Steve is going to have to bike a bit harder to beat Kurt’s record. I think Kurt’s achievement is just mind-boggling. Kurt biked between 10 and 13.17 hours a day for a year. He biked a total distance equivalent of 25 times across the US and more than 3 times around the world. I hope he is taking a long rest now. 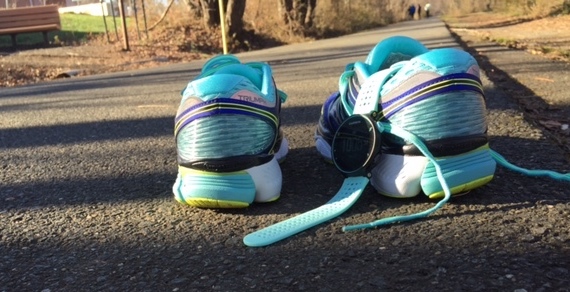 New shoes and a new Garmin to help me reach my 2016 goal! While I would never attempt a cycling record, I have thought about starting my own running streak. It sounds like a good goal but I don’t think it is a Transverse Myelitis-friendly one. I need a lot of rest after long runs. I also don’t want a hobby that ends up feeling like a job. That would take the joy out of it for me. I am just going to keep doing my thing – running 3 days a week and getting in my strength training while watching what I eat. That will help me achieve my next goal – a half marathon personal record (PR) in 2016.